Gmail is probably one of the most popular email services around. But it has some major drawbacks: the most obvious being that the webmail client shows targeted ads around your mail. Even more important, you can’t use your own domain unless you are willing to pay $49.95 a year. What I do like about Gmail is how easy it is to setup on your mobile phone. It doesn’t matter if it’s an iPhone, or an Android (duh). Just hit the Gmail icon on your phone and within seconds you’re good to go. And you can use Gmail Calendar to sync your appointments across all of your devices. It also has an excellent spam filter, allows for both POP and IMAP access, has tons of filter options (including the dreadful tabs) and a very stable connection. But this all doesn’t make up for the fact that you can’t use your own custom domain. Any professional company should not be using a ‘mycompany@gmail.com’ email address. But $49,95 a year is a lot, especially when you are using multiple email addresses (because yes, this price is per account!). So let’s look at some Gmail alternatives. Preferably free or low priced, and definitely allowing for a custom domain. IMAP access should be standard, same goes for webmail. And it would be nice it you could use an integrated calendar. Outlook.com used to be a great alternative to Gmail: No ads, practically unlimited storage and email accounts all with your own domain. But they canceled the custom domain service, in favor of their paid Office365 product. After wading through dozens of email providers, I came up with this final selection: Zoho Mail (the only free alternative), Rackspace Email and plain old regular hosting. Turns out the combination of free/low pricing and a custom domain is a rare one. Let me start by saying that if you don’t plan on needing more than 10 user accounts (or 25 if you refer 3 other customers), Zoho Mail will be your best choice. I just love Zoho apps. I’ve reviewed their CRM and accounting products before, and they all have the same business model: tons of features with a generous free plan, and even more features for the (quite cheap) paid accounts. Zoho Mail comes with 5 GB of storage per account, offers an integrated calendar, tasks and notes apps and even comes with 5 GB of shared docs storage. It has a webmail interface that’s nothing special, but easy to use with a number of basic setting. You will also have to specify an admin account, which you can use to select some overall settings. 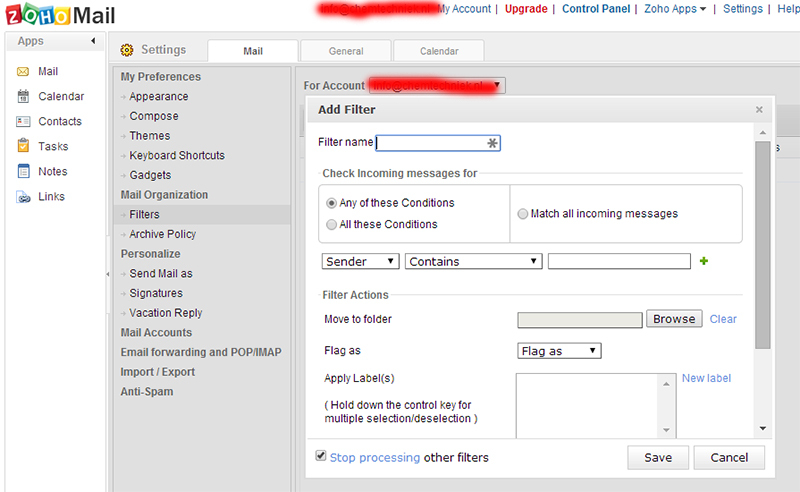 You can use IMAP and POP use filters based on email addresses, content or priority along with unlimited email aliases. It’s only downside is the spam filter. I am using Zoho for a number of clients, but a decent amount of spam is still coming through. You can’t change anything in the filter itself (like raising the threshold). Your only option is blacklisting domains, which is a tedious and useless task. The feature set for their free plan is very extensive, sufficient for small business and freelancers. It even comes with support, along with excellent support documentation. Basically the only reason to upgrade is when you need more than 25 user accounts, or more storage. At $2.50 a month per user it’s still a steal compared to most paid providers though. RackSpace won’t be the first or even the second company you think of when it comes to hosted email. But they built a pretty decent Gmail alternative. It’s not free, but it’s not as expensive as you might think either. RackSpace Email is priced at $2 a user per month, and comes with 25 GB of storage. But to be honest, that’s not really a special feature. What is special is their 24x7x365 support, especially since you can get an instant response by phone or chat. And they provide an 100% uptime guarantee (compared to Gmail’s 99.9%), which at least ensures maximum effort to keep your email coming in. RackSpace Email offers both POP and IMAP access, and offers a simple webmail interface (you could also call it easy to use). 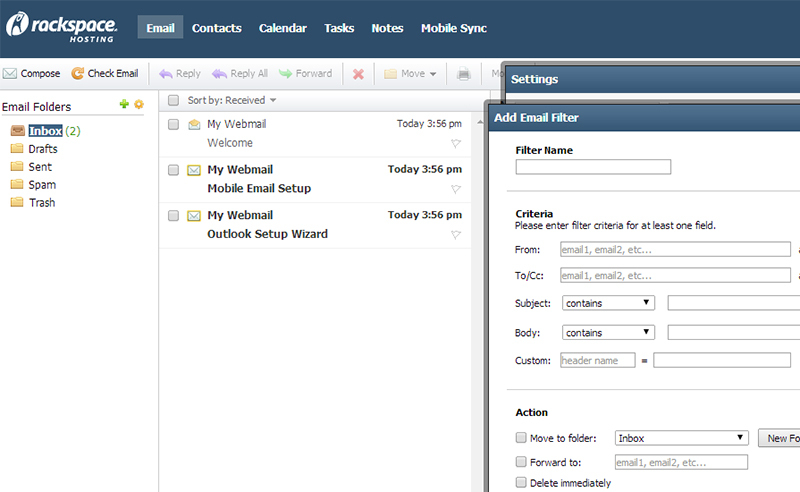 It offers the same filtering option as Zoho Mail. Nothing fancy but it gets the job done. The real surprise is in the Contacts and Calendar screens. 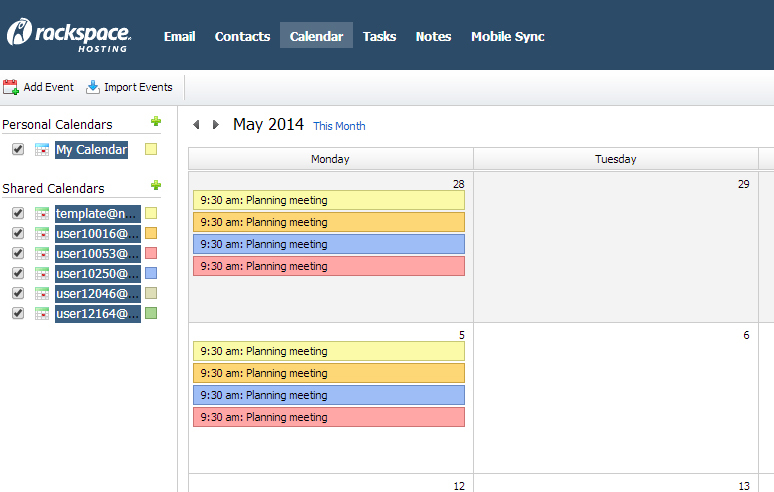 If you don’t mind using webmail, you can have access to shared calendars and contacts. Shared calendars are not common with hosted email providers, but they’re very important to have if you are running a sales or support team with leads or tickets to follow up. These features, combined with excellent reliability and support, make RackSpace Email an excellent alternative. If you want to go really fancy you can even get Hosted Exchange for $10 a user per month. But the regular email product will do the trick for most of us. Most people think of regular web hosting when it comes to hosting email addresses. But with some very advanced webmail clients nowadays you can practically build your own Gmail alternative for a few dollars a month. In most cases you can use as many domains and email addresses as you like. While most hosting companies offer POP, IMAP and webmail in their default packages, this doesn’t mean you can just sign up where ever you want. Truth is many hosting companies don’t really like hosting email, since it’s quite easy to have your IP range labeled as spammy if you attract the wrong customers. There’s also a difference between secure (SSL, which is prefered) or non-secure IMAP/POP access, and basic or advanced webmail clients. So you have to do a bit of research. But when you do, you can find some very interesting options. For example for one client I wanted to use server side filtering of emails. While this might seem easy (most hosted email providers offer it), this isn’t the case with the most popular webmail apps. Popular webmail clients like Horde and Squirrelmail require a plugin to perform this task. This means a web host has to support it, and most of them don’t. This seems like a trivial feature. But if this is what your client is looking for, you just might end up moving the whole domain to a different provider if you current one doesn’t support it. The only downside is that most webmail clients don’t offer any type of calendar functionality. Some of them offer plugins for this, though, but again your host has to support it. All I am saying is that you need to be sure that you get what you need before signing up. But when you do, I hope you agree with me that using regular web hosting is a pretty good Gmail alternative, at very low cost. With this article I wanted to present you with three very different Gmail alternatives. Zoho Mail seems the most obvious one, and probably is the best alternative if you need just a few accounts. RackSpace Email is a very cost-effective alternative. RackSpace has an excellent reputation when it comes to support and reliability, and its pricing is very competitive. Doing it yourself by using regular web hosting is a very viable and cheap alternative, as long as you use a decent hosting company. Just make sure you do your research first. Let me know in the comments which option your prefer, or what you consider the best Gmail alternative.